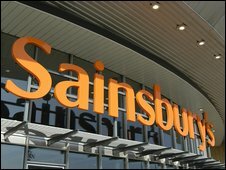 High Street supermarket Sainsbury's has raised about £432m in order to accelerate its growth plans. Sainsbury's chief executive, Justin King, said the money would give the retailer the flexibility to grow "further and faster". The news came as Sainsbury's announced that its like-for-like sales - which strip out new store space - for the 12 weeks to 13 June were up 7.8%. On Tuesday, rival Tesco said its UK first-quarter sales had risen by 4.3%. The retailer raised the money through a combination of selling shares and bonds. It raised £242m from a sale of shares, priced at about 310p each, and £190m from a convertible bond offer. It said it wanted to use the money to increase the amount of floor space in its stores by 15% by March 2011, against a previous target of 10%. Mr King said he was "still cautious about the economy", but he added that the planned investment would create the chain's "fastest period of growth since the early 1980s". Sainsbury's also announced it had agreed to buy nine stores from the Co-operative Group for £29m. These stores are in addition to the 24 outlets it bought from the Co-operative Group in March this year, following the Co-op's acquisition of Somerfield. Total sales at Sainsbury's - including new store space - were up 3.2% in the quarter. The like-for-like sales growth of 7.8% - excluding fuel and VAT - was well ahead of Tesco's 4.3% increase in UK sales in the three months to 30 May, and close to Morrisons' sales growth of 8.2% recorded in the 13 weeks to 3 May. The firm said that customers were spending more "cautiously", and said sales of its "basics" range were continuing to grow by more than 50% from a year ago. Its online food home shopping service had seen sales up 20% in the quarter, and Sainsbury's said it would start selling non-food items - including kitchenware and furniture - online in the next quarter. Richard Hunter, head of UK equities at Hargreaves Lansdown Stockbrokers, said: "Although the sales growth figures are in line with expectations, they nonetheless provide further evidence of the aggressive expansion which Sainsbury is pursuing." About half of the new space will be for non-food lines, the company said. "This is not good news for Tesco's," JP Morgan analysts said. Shares in Sainsbury's closed down 5.65% or 18.75 pence at 313 pence.